As we are still waiting for retail availability of Android TV boxes and mini PCs based on AMLogic S802 quad core processor, rumors have started to surface about another quad core processor by the company called S805 to be used in media players, and probably it’s equivalent M805 for tablets. 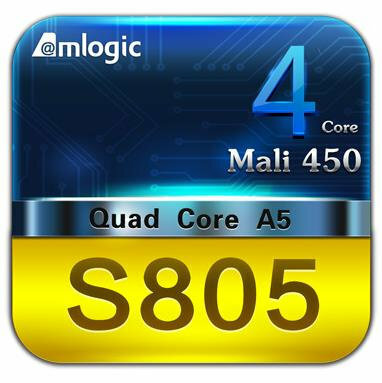 M803 and M805 were already part of AMLogic roadmap and were said to feature quad core CPU and GPU. It turns out M805 and S805 will feature four ARM Cortex A5 cores @ 1.5 GHz combined with a quad core ARM Mali-450 GPU (Mali-450MP2 ?). That probably means no 4K support like in M802/S802. There should also be a M803 tablet version pin-to-pin compatible with M801/M802, and possibly the equivalent S803 for media players. There’s currently a battle between H.265 (HEVC) and royalty-free VP9 codecs, and some online service may choose one over the other, although I believe they’ll most probably support both as is the case with VP8 and H.264 we all use today. So ideally an SoC should support both, and it will become more and more important to getting hardware with proper H.265 or/and VP9 hardware decoding to get a much better user experience for online video streaming: either not seeing that buffering spinning wheel so often, or/and moving to an higher resolution. I don’t really see Gigabit Ethernet for a 1080p media player as a big advantage, since I don’t know any 1080p videos that will saturate the 100 Mbps bandwidth. For media centers and 4K videos that’s another story however, and Gigabit Ethernet will become a must. The advantage with Gigabit Ethernet is that you could now use this SoC for NAS (Network Attached Storage) too, or a combo NAS and media player as such convergence devices are becoming more popular. Several NAS from large manufactures today already feature HDMI output and app store with XBMC for them, but these NAS boxes are all Intel x86/x86-64 based. None of those combo NAS boxes with XBMC are ARM based. Yep. I agree. I call media player with a HDD a media center, maybe it’s not the right expression. Or did you have more luck cnxsoft? @cnxsoft No you are almost right. A “digital media player” with harddrive is still just a media player, nothing more. So just because a media player has a hgarddrive does not make it a NAS. A “media center” is something more, and usually either refers a HTPC, or it can refer to a “digital media player” with the an external receiver/amplifier and a television set, as them the whole setup can be called a “media center” or “entertainment center”, which may also include a game console. But when I say NAS I do not simply mean a “digital media player” with harddrive, as that is not a NAS. No what a NAS is a appliance with harddrive(s) and real CIFS/SMB/Samba/FTP/NFS/AFP serving capability, with minimum really being CIFS/SMB/Samba support today. And when I say media player and NAS combo then it needs to either be a real NAS with media player capability, or a media player with real NAS (CIFS/SMB/Samba server) capabilities. Media player with harddrive that only have UPnP and HTTP server can not really be classified as a NAS. 1) a SoC with BGA? Is that common? Still no answer to my request. It’s safe to assume they just ignored my email. If you have a media player and a hard drive, it’s likely you could transform it into a simple NAS. But I agree by default it does not make it a NAS. I’s not samba/ftp that’s missing in my linux mele a1000 to be a NAS, is the double sata connection….. with a dual controller I could format 2 drives as btrfs data mirroring (RAID 1) and completely forget anything else. USB isn’t the same (and having 2 usb port used for HHDs and one for keyboard leaves nothing for external memmory/peripherals). Unlikely that you can convert many media players with hard drive to a NAS, unless you can root them and install Linux it is very uncommon that you can use them as a NAS that support serving CIFS/SMB/Samba to the local network. And even if they did they they still miss a GUI management interface for the NAS part. In fact a majority of media players with internal hard drives does not even have a Ethernet port or support WiFi network.